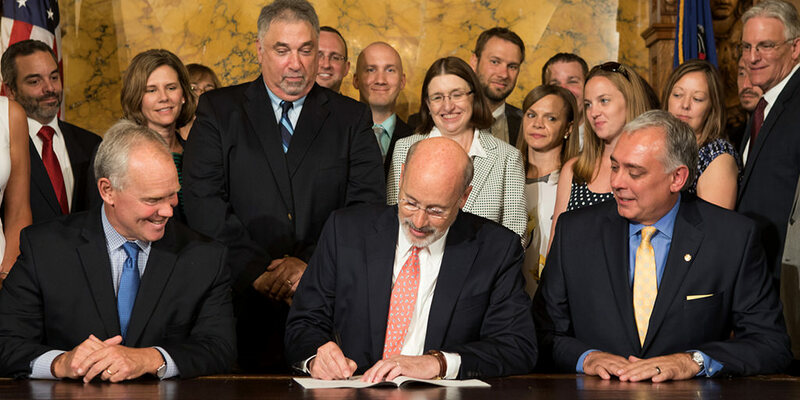 Harrisburg, PA – Governor Tom Wolf today signed House Bill 202, known as Act 6, into law. The bill, sponsored by House Speaker Mike Turzai, amends the Public School Code to allow students in career and technology education (CTE) to demonstrate proficiency and readiness for high school graduation in an alternative pathway, and removes the statutory requirement for the Keystone Exam on that student population. Act 6 implements one of four recommendations made by the Pa. Department of Education (PDE) pursuant to Act 1 of 2016, which paused the Keystone Exam graduation requirement for a period of two years (delayed until the 2018-2019 school year). Specifically, Act 1 required PDE to investigate alternative options for a state level graduation requirement and provide those recommendations to the General Assembly. Demonstrate competency in standards-based subject matter content through course grades or assessments plus evidence related to postsecondary plans that demonstrate readiness to meaningfully engage in those plans. Passage and enactment of this bill, which addresses the third recommendation above, supports Governor Wolf’s position that passing a high school exit exam is not the sole valid measure of proficiency and career readiness, and that Pennsylvania should take a more holistic approach by enabling students to demonstrate their knowledge and skills through multiple valid measures.